If you happened to uninstall Simio without returning your roamed license, you need to in reinstall the same version in order to return the roamed license. 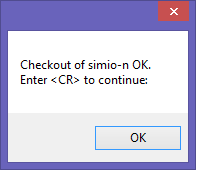 If you just uninstalled Simio 4.79 or higher, you have another option. In the attached zip file (ReturnRoam.zip), there are 2 executables. Unzip these executable into the C:\ProgramData\Simio folder. Then, run the "ReturnROAM.exe". When prompted, select the license (simio-d = Design, simio-e = Team, simio=n = Enterprise) and the year.month that the sprint was released (e.g. Sprint 87 was released in 2013.04). Then press "Return ROAM". The executable will return the roam license. If successful, the following dialog will be displayed. If it is successful with returning the roam license, it will remove the roamed license parameters from the Simio.Settings file. Thanks Glen. I hope this thread is visible enough for someone who encounters this issue. It might also be worth packing it with future Simio releases and calling it something like ManualReturnRoamedLicense.exe ... or something.